4,5-bis[(4-phenoxy)phenoxy]phthalonitrile was obtained by the reaction of 4,5-dichlorophthalonitrile with 4-phenoxyphenol. On its basis 2,3,9,10,16,17,23,24-octakis-[(4-phenoxy)phenoxy]phthalocyanine and its single- and double-decked complexes with erbium were synthesized. Spectral-luminescent properties of resulting phthalocyanines were studied. 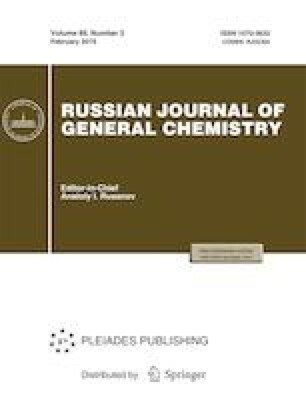 The tendency of phthalocyanines to association in dichloromethane depends on the structure of their molecules. Russian Text © A.I. Koptyaev, N.E. Galanin, G.P. Shaposhnikov, 2019, published in Zhurnal Obshchei Khimii, 2019, Vol. 89, No. 2, pp. 277–282.